1. A company identifies an area that they want to prospect or explore for gold. 2. 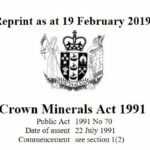 They apply to New Zealand Petroleum and Minerals for a permit (prospecting, exploration then mining). This gives them the right to the minerals, not the land (although, if they are prospecting they may enter your land without your permission). 3. They apply for whatever resource consents are required in the District/Region in which they operate – in our case, this will be governed by either of 2 Regional Councils: Waikato Regional Council of Bay of Plenty Regional Council, and either of 2 District Councils: Thames Coromandel District Council or Hauraki District Council. What consents they need, what is permitted or not is different under each council. 4. Regional Councils have a regional Plan which outlines what needs a consent, what is allowed and what is prohibited. District Councils have a District Plan which does same. 5. Resource Consents can sometimes be publicly notified, but often are not. That means that a community might get a say in whether or not a Consent should be granted. This will generally only happen when a consent if for a pretty significant activity. For example, none of the drilling or clearance of bush or water take at Wharekirauponga has been notified, despite this being a Significant Natural Area, public conservation land and a popular area for tramping. 6. If they are notified, it may be limited to only people considered to be ‘affected’ – often only immediate neighbours to the area where the activity is proposed. These people will generally be notified via letter. 7. Or if it is publicly notified, it will be done by publishing an ad in local publications inviting people to make submissions on the activity. 8. Coromandel Watchdog can help with both of these. 9. If the proposal is over private land, the company must seek permission of the landowner to enter the land (other than for a prospecting permit, as above). 10. If permission is granted, then that is lodged on the title, meaning that if you then want to sell your land, future owners will also be bound by any agreement you agreed to. 11. 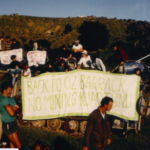 If you decline permission, the mining company may still access minerals beneath your land from a neighbouring property – i.e. mining underneath your property. NB: There is no provision in the permitting system for public consultation. Generally communities only find out at the mining stage, if resource consents are required and the affects are deemed to be more than minor. Even at that stage, there is no guarantee communities will get any say.